Charlie Cairoli was born in Affori, a district of Milan (Italy), on February 15th 1910, to a travelling circus family of French origins. Alongside his father (Jean-Marie) and his brother (Filip), Charlie was part of the famous Cairoli Trio, who travelled all over Europe. During the 1938/1939 season, the trio was booked in the Christmas pantomime in Birmingham (UK), where they were spotted by the director of the Blackpool Tower Circus. When the Second World War broke out in September 1939, the Cairolis were already based in the UK, playing at the Tower. Having been called for active military duty, Filip had to return to France, but soon left for Spain and later South America, where he spent the remainder of his career. 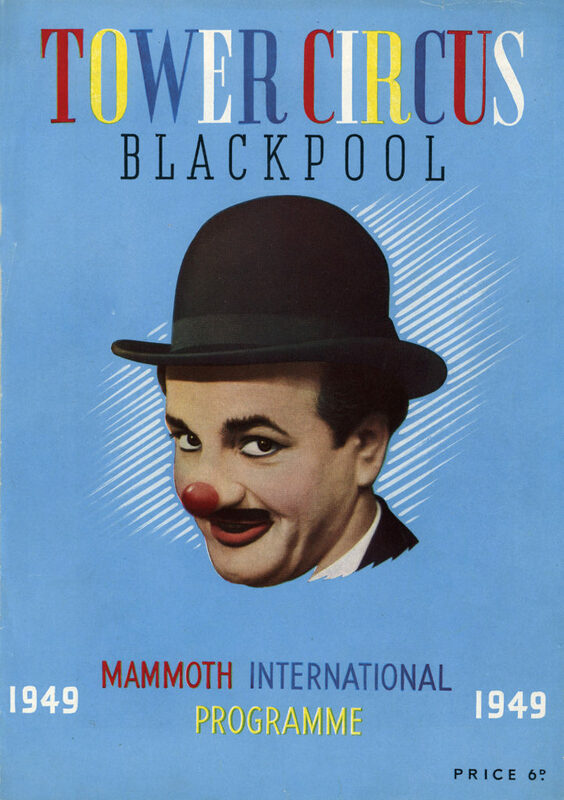 Charlie and his father remained in Britain and were booked again for the 1940 season at Blackpool Tower Circus. In June 1940, after only two weeks of performing at the Tower, Charlie and Jean-Marie were arrested and deported to the Isle of Man, on account of being of Italian descent. Nevertheless, when proof of their French citizenship arrived, the duo was released and rebooked for the following seasons at Blackpool. During summer months, they continued performing at the Tower, which remained open throughout the war. In between seasons, the two worked for some time in an ammunition factory, entertained troops and found various employments in music halls. While Jean-Marie left for France in 1947, Charlie continued his career at the Blackpool Tower Circus until his retirement in 1979. He died of a heart attack soon after, in 1980. Charlie was naturalised British immediately after the war and went on to become Blackpool’s most renowned and celebrated clowns. In 2013 a statue of Charlie Cairoli was revealed in Blackpool. Jamieson, David (ed. ): Clowns of Blackpool Tower Circus. Little Hormead 2001; Turner, John:. Twentieth Century Circus People (1901-1950). 2003. Liverpool 2003; National Fairground and Circus Archives: John Turner Collection; Blackpool Gazette: Towering Circus genius where he belongs. 23 October 2003; BBC News: Blackpool honours stars circus clown Charlie Cairoli. 21 April 2003; Circopedia. Charlie Cairoli.